Benchmark Home Improvements | Double Glazing Windows, Conservatories, Gutters, Fascias and Soffits based in Farnborough. Supply and fit to Hampshire, Surrey and Berkshire. Telephone 07800 774098. Maximise your home with Benchmark Home Improvements today; get in touch with us now for advice or a FREE quote. When it comes to double glazing, doors, conservatories and gutters, Benchmark Home Improvements is a name you can trust. Call us today for free advice or a no obligation free quote. Hampshire Home Improvements: Aldershot, Alton, Basingstoke, Bordon, Chineham, Crookham, Eversley, Farnborough, Fleet, Hartley Wintney, Heckfield, Hook, Liphook, Kingsclere, Yateley. Berkshire Home Improvements: Aldermaston, Ascot, Bracknell, Cookham, Finchampstead, Maidenhead, Marlow, Reading, Sandhurst, Swallowfield, Twyford, Windsor, Wokingham. 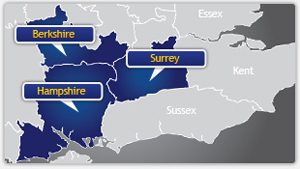 Surrey Home Improvements: Addlestone, Bagshot, Blackwater, Bramley, Camberley, Chobham, Chertsey, Cobham, Cranleigh, Dorking, Egham, Epsom, Farnham, Frimley, Godalming, Guildford, Hindhead, Leatherhead, Lightwater, Milford, Richmond, Rowledge, Shepperton, Staines, Sunbury-on-Thames, Sunningdale, Sunninghill, Tilford, Virginia Water, Walton-on-Thames, Wentworth, West Byfleet, Weybridge, Wonersh, Wormley.